Here it is! Volume 1. A lot of something funny for everyone. This volume is guaranteed to contain an intro joke, a sneaky friend, a super-villian, an origin story, an idiot friend, a cranky author, a homicidal turkey, brother torture, a crazy grandpa, parents who give their kid's bedroom to a biker, self surgery using rusty pliers, and lots of laughs. For a special video preview with the contributing authors, go here. 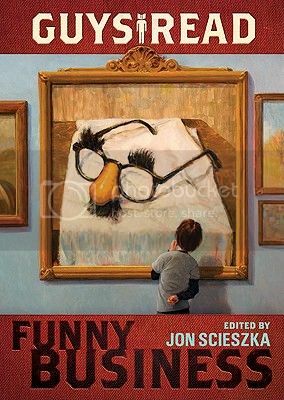 Guys Read, Vol 1: Funny Business is available at your local library, bookstore, and online at Indiebound, Powells, Barnes and Noble, and Amazon.